At a family gathering a cousin passionately, beer in hand, told us about how he and his wife were raising good kids. Five minutes later the conversation had shifted a bit and he confessed with a shrug of his shoulder, "I'm a little racist." We laughed at the juxtaposition. We laughed at his confession. Since that conversation over a year ago a lot has happened in our nation. A lot has also happened in my head and heart. I don't laugh at that cousin's comment any more. Instead I now appreciate the fact that he had taken a look at himself and his views, compared them to accurate definitions of words, and realized that he was, in fact, a little racist. It took a year, but he has humbled me, because the fact is I am also a little racist. That is a hard sentence to type and it's one I didn't want to ever believe was true, but it is. With every sad shooting and death there is pressure on social media for Christians to speak out, for white people to speak out, for white Christian bloggers to speak out. I understand why. I also understand that when I don't say anything people assume. 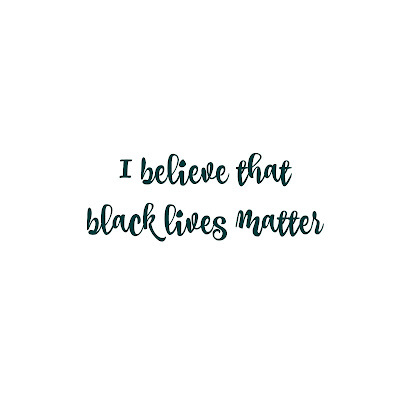 They assume I don't believe that black lives matter. For the record - because I want my kids to know this when they look back at this moment in American history - I do, though. 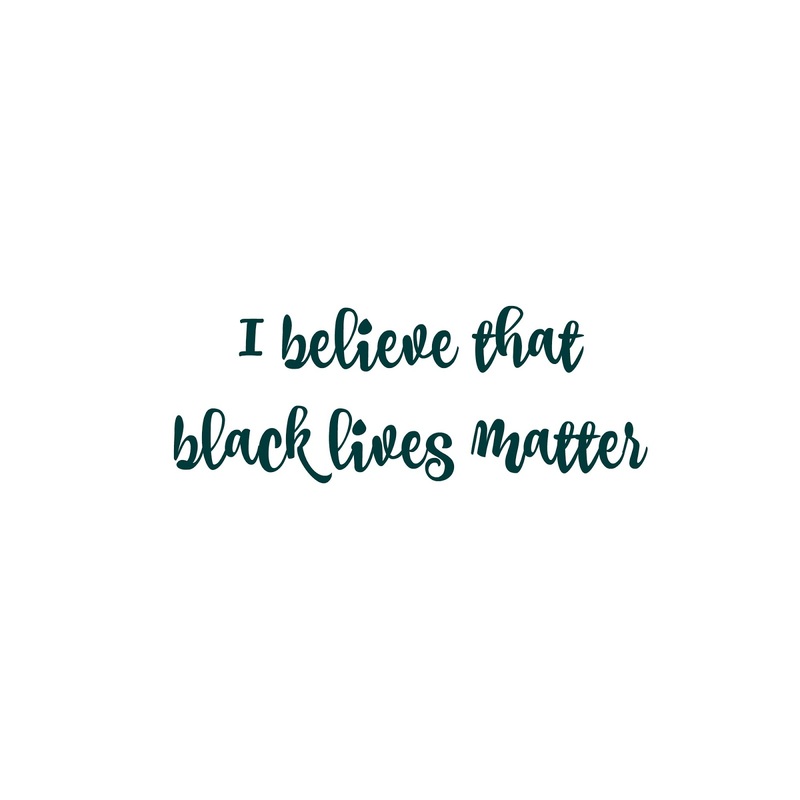 I do believe that black lives matter. But I don't speak up, and the reason for this is because the Black Lives Matter movement has given me a spotlight to shine on my own heart. The heat is intense and I'm seeing ugly, broken bits of myself all over the place. In short, it is painful to both see what I am (a little racist) and to grow from that perspective. I don't speak up because instead I am paying attention. I am reading comments and articles. I am listening to black people. Because I do not have any black friends, only acquaintances, I really appreciate the vulnerability I have found online and in the media. I don't speak up because everyone has a different story and perspective and I want to be respectful of all the various histories and opinions. I want to consider them, reflect on them, and focus on them as they are shared. I know there will be people who still believe that I should speak up, but right now God is working in my heart and I can clearly see that it needs to happen in a calm, quiet, private way. This goes for more than just racism in America, too. If I remain quiet about the Orlando shooting or Syrian refugees please know that it's not because I don't care. I care a great deal. I am learning so much and the information both makes me cry and gives me hope. I want to cry because of the ways we ignore the value of human life and the ways that I have played my own part in it. But I have hope because if listening and praying and searching can lead to God growing my grinch-sized heart then I am certain we can fix this. But please, don't think that just because I haven't updated my Facebook status that I don't care. I do, and because I do I am updating my life, my views, and how I teach my children. When we stop separating ourselves, when we stop thinking of each other in terms of color, ethnicity and the myriad ways we divide each other into compartments and categories, maybe then we'll lose the labels that define. I'm tired of it. There is one race: human. That encompasses unborn humans, infant humans, adolescent humans, adult humans and elderly humans. It gathers in weak, strong, healthy, sick, able-bodied and disabled humans. All of us have red blood. And all of us are children of the Living God. This is good. The hardest part that I've had to deal with when sharing that black lives matter is having some folks think that other lives (specifically law enforcement officers) somehow don't. Correcting that misconception hasn't been easy for me to do as of yet. I don't think that because you've chosen not to speak on the current hit button issues that makes you a racist. Not even a little bit. Oftentimes people just don't know what to say and might feel this unnecessary pressure to say something. You have a good heart. Racist is a such an ugly word and I believe it gets brown around too much and used too loosely. Don't box yourself into that category. That's not you. Not even a little bit. “I want to cry because of the ways we ignore the value of human life and the ways that I have played my own part in it.” Well put, Bonnie. I often feel the same way - with BLM, with immigration, etc. It’s a hard process working through racism and realizing the things (no matter how small) we’ve done to perpetuate injustices in our system. And it’s a good thing if we feel uncomfortable when talking about racism, because if we don’t, we’re probably just avoiding the ugly/inconvenient stuff. I just heard on NPR this morning how they did an eye tracking study of pre-school teachers. They found that teachers spent more time watching black boys than other kids in the classroom, because they expect misbehaviour from them. And just from the simple fact of watching the boys more, the teachers find more things to get them in trouble for than they do with the other kids (who might be doing similar things but they just don’t have the teacher’s eyes on them as much). A friend of mine (white) has adopted five black children. She shared many stories with me that were just horrible and I was shocked. One of the things she told me was that her kids will be doing the exact same thing as white kids but her children will be scolded. It's total crap. Thank you for this. Me too. Yes to all of this. Thank you. I don't know how I missed this before but catching up now and really appreciate it. I think there is undue pressure on bloggers (or maybe everyone?) to post something related to the topic all the time. I know I sure feel it. But in my opinion one humble post like this is worth a thousand on social media. Thanks for speaking out from right where you are. It means a lot.